Prema vilasa about the disappearance of Srila Sanatana Goswami and how Srila Rupa Goswami was very much affected by his divine disappearance. 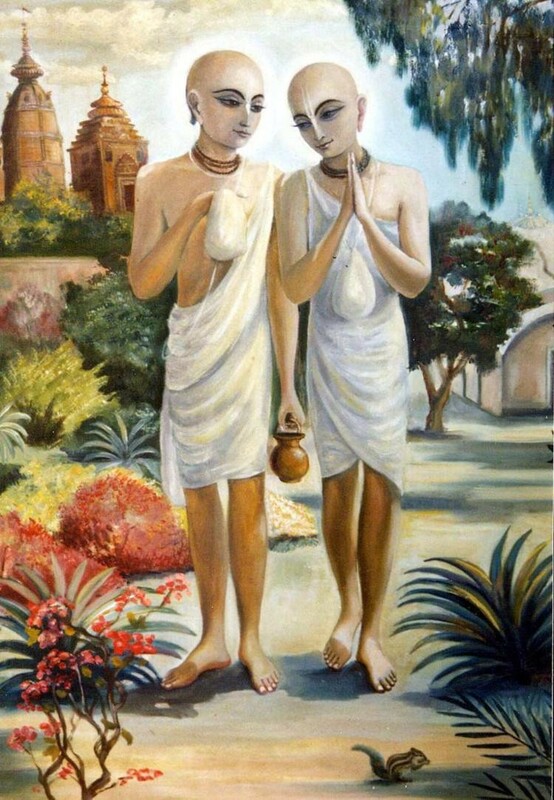 2) Where are my Svarupa Damodara and Rupa Gosvami? Where is Sanatana? Where is Raghunatha Dasa, the savior of the fallen? In the eastern part of Sri Tungavidya’s kunja lies Lavanga-sukhada Kunja, which is very enchanting to all the beautiful-eyed gopis. In that kunja, Sri Lavanga Manjari always blissfully resides. In age, she is one day older than Sri Rupa Manjari, and she is very famous for her pleasant nature. Her complexion is like lightning, and she wears a dress marked with stars. She gives much happiness to Sri Krsna, and her nature is always daksina-mrdvi. Her age is 13 years 6 months and 1 day. In Kali-yuga, in gaura-lila, she is known as Sri Sanatana Gosvami.